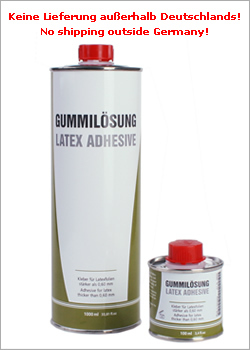 This adhesive is for latex thicker than 0,60 mm. For thinner material please use our adhesive 49004. Important: Due to air cargo security regulations we are not allowed to ship this item outside of Germany. In Germany a maximum of 4 Liters can be send by mail in one package. For orders with larger quantities, we will charge another shipment. We are happy to send you latex remnants for adhesion tests or repairs. Please let us know what Colors and Strengths you need.